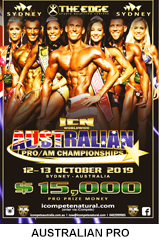 The 2019 ICN Sydney SUPER SHOW is on the 12-14 April with registration at the ICN Members Portal at www.icompetenatural.com This is the largest fitness expo in Australia and a magnificent opportunity for exposure on a grand scale. Networking to the max and of course one totally awesome competition to compete in or witness. Make a weekend of it and enjoy the Sydney scene and find out why it is the most amazing city in the world. 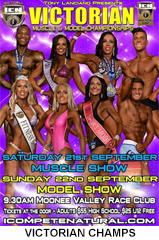 The 2019 ICN Melbourne Muscle & Model Championships Plus Transformation Show is on Sunday 7th April at the Moonee Valley Race Club from 10.00 am, tickets in cash at the door. This prestigious event is a qualifier for the City National, World Cup in Korea, Universe in Rimini, Italy plus the Australia and ICN World Championships in Melbourne in October. It's going to be a sensational day of sporting and fitness excellence, see you there!! !